Eisenhower was a great general and an OK President, but awful on economics. His rational for maintaining high tax rates was that we needed to pay for the Korean War and a nation-wide highway system. Whenever the economy of the 1950’s is considered one must realize that US productive capacity was not damaged during WWII, whereas the rest of the world was rebuilding. The US was supplier to the world in their rebuilding efforts. 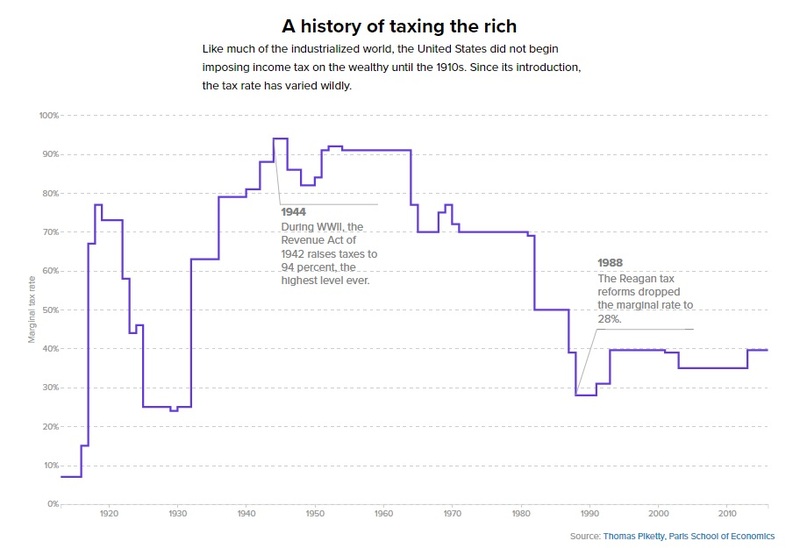 Imagine how much better the US economy could have been with a better tax structure. The zero sum fallacy is a persistent folly indulged in by the left. Good point, and another example of why it is problematic to introduce ‘fairness’ into these policy debates. Person A makes $75k, saves 20% of it every year by being frugal, and invests wisely. Toward the end of his working life, he is worth $2 or $3 million. Person B makes the same $75k, but saves nothing because he like to spend money on cars and vacations. He ends up with little wealth. Both A and B had the same income and opportunity to save and invest. Person A has wealth only because he was prudent and frugal. How then is it ‘fair’ to tax his wealth to subsidize Person B? Unfortunately, some people think that wealth falls from the skies, or that all wealthy people are trust fund babies. A Covetous statement if there ever was one. With $1.3 trillion in tax expenditures (credits, deductions, special rates, deferrals and exemptions) the nominal tax “rates” have become meaningless. This amount does not even include the exemption from payroll taxes for high earners or the much larger exemption for non realized capital gains. Most of the economic income of the rich will never be taxed at ordinary rates. The ONLY way to keep rates low and fair is to tax all three tax bases: wealth, income and consumption. If you think there is something wrong with taxing wealth there is something wrong with your values.